St Vincent, aka Annie Clark, is one of the hottest acts on the rock circuit at the moment with her last album, 2014’s St Vincent, featuring highly in best-of-the-year lists for Pitchfork, New York Times, NME, and Rolling Stone, while The Guardian named it as its album of the year. 2014 also saw her turn in memorable performances, from Saturday Night Live to a Rock and Roll Hall of Fame induction ceremony fronting a reunited Nirvana, while NPR Music acclaimed her live show as the No 1 concert of the year, raving, "Nothing was better than this". It is no surprise then, that St Vincent’s upcoming concert at the Big Top is one of the most eagerly awaited events at this year’s Galway International Arts Festival. St Vincent features Dap-Kings drummer Homer Steinweiss and frequent collaborator McKenzie Smith of Midlake and includes the tracks ‘Bring Me Your Loves’, ‘Regret’ and ‘Digital Witness’. An eloquent blend of passion and precision, the album was widely hailed as the strongest material of Clark’s career so far, with The Guardian calling it "a straightforward triumph". Clark has spoken of the conservatism of Dallas when she was growing up there; music provided her with a refuge. “I cultivated an inner world and a real obsession with music because when you're young that's your armour, how you form your identity." She was nine when Nirvana’s Nevermind was released and the album had a huge impact on her - her youthful musical heroes were Kurt Cobain, Pearl Jam, and Sonic Youth. She started playing guitar when she was 12, and four years later her family let her join her uncle on tour by way of allowing her learn about the realities of life on the road. Clark’s uncle, Tuck Andress, is one half of the jazz duo Tuck and Patti, and Clark was basically another roadie on a tour that took in dates in both Europe and Japan. “I never worked as hard in my life,” she says of the experience. Clark enrolled in Boston’s prestigious Berklee College of Music but dropped out after three years and decamped to New York, with dreams of commencing her musical career proper. Alas she ran out of money after three months and was compelled to return to Dallas. However, just a few weeks after going home she joined the symphonic rock/pop band The Polyphonic Spree as guitarist. This led to her working with Sufjan Stevens' band, and the following year saw the release of her debut album, Marry Me. Clark's career was up and running. Notwithstanding her apprenticeship with other groups, Clark always wanted to be a solo artist. She took the name St Vincent from the Nick Cave song ‘There She Goes my Beautiful World’ which refers to the St Vincent hospital in New York, in which Dylan Thomas died. The name also alludes to her own great-grandmother whose middle name was St Vincent. Marry Me took its title from a line in the TV comedy Arrested Development. Clark describes herself as “a comedy nerd” and she has made guest appearances on Portlandia. I ask her who her favourite comics are and she replies Louis CK, Steve Martin, Richard Pryor, and Bill Hicks. Marry Me showcased Clark’s multi-instrumentalism as she is credited with playing 17 different instruments on the recording and the album was well received by the critics. After a lengthy tour supporting the album Clark returned to New York and released her follow up album, Actor, in 2009. Her third, Strange Mercy appeared in 2011. Each St Vincent album has increased steadily in musical ambition, sophistication, and accomplishment and has met with a corresponding growth in critical acclaim. 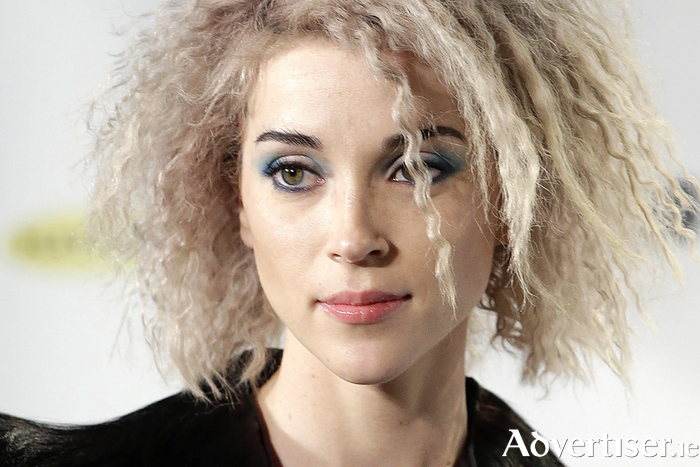 Last year’s St Vincent has propelled onto her a whole new level of ‘stardom’. Clark would seem to be someone with her finger very much on the pulse of the vital currents in modern life. Her music is equally fresh, of-the-moment, urgent, and compelling - as Galway is about to discover.